Between 600,000 and 800,000 bitcoin miners have shut down since mid-November amid declines in price and hashrate across the network, F2pool's founder estimates. 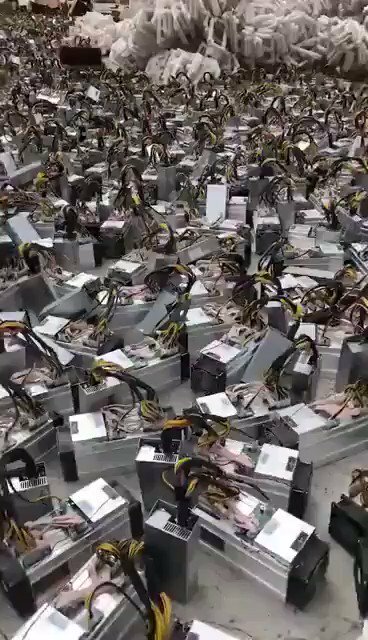 Could be a good time to start mining? I know nothing about mining. But when it comes to trading I think there is chance to keep going for the downside, bears still have more power, it could even reach around the 3000USD mark. Mining’s quite expensive. I’m not really sure it’s a good investment. Have you been thinking about mining @purtle? Have you been thinking about mining @purtle? No, not really. It’s a very cool process though! Yeah! Sounds super cool. If only we could still mine crypto through puzzles and quizzes. In a series I watched, they mentioned that’s how they got their BTC. Haha. I think there are still some coins that let you do this! But I don’t know… that’s still time you’re spending, and that’s worth a lot. So even with solving puzzles, that’s still a no for me haha. Hahaha. Yeah. Makes sense. They say BTC price will continue to go down so I might reconsider purchasing a few then. I guess we’ll just have to wait and see. Hahaha. I’ll keep this in mind purtle! Thanks for the advice. Good luck with your own BTC trading too. Good luck with your own BTC trading too. Yeahhh… I don’t know that any amount of luck can change my BTC portfolio’s fate but I guess I’ll take what I can get haha. Thanks!